Among the early inventors experimenting with underwater boats was a brilliant German immigrant to the United States, Julius H. Kroehl. Unbeknown to many marine historians is the fact that Kroehl successfully built and put his craft, known as Sub Marine Explorer, to sea off San Telmo, Panama, in 1866. The Sub Marine Explorer proved to be a successful invention that Kroehl an his crew took to relatively extreme depths of the Pacific and returned to the surface again. Unfortunately, little was known about decompression sickness caused from deep dives in those days. Kroehl did not die in a sunken submarine, but rather of the bends in 1967 after using the vessel to take him to the bottom to collect oysters and pearls. 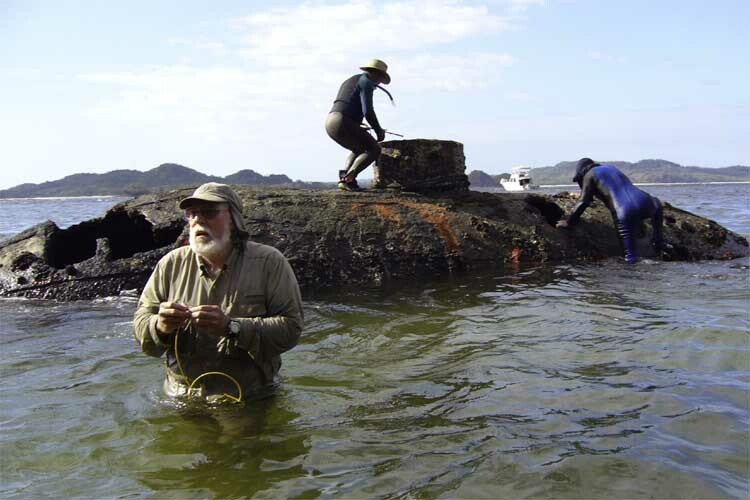 The story of Kroehl's exploits was revealed after James Delgado, director of the Vancouver Maritime Museum, accidentally discovered the remains of the old submarine along the beach, off the coast of Panama, at low tide. It had apparently been left there to rust for more than 130 years following Kroehl's death in a local hospital. An article written by Sven Robel for a German publication described the vessel as "a high point in maritime engineering. . . Equipped with a cleverly designed system of ballast chambers an a compressed air tank that allowed for pressure compensation, it also ha to hatches beneath the hull enabling divers to exit the craft underwater." Robel wrote that the upper half of the ship's double hull was made of pressure-resistant cast iron. The lower half was made of wrought-iron plates attached with rivets. The boat had no engine, but was moved by a propeller driven by muscle power. He said that Delgado also found a depth gage filled with mercury and the wooden handle of a manually operated pump, which he believes was used to improve the air in the submarine while under water. He theorized that the pump sprayed a fine water vapor meant to bind the carbon dioxide. Kroehl's crew consisted of up to six men, manually operating the submarine in cramped quarters, in candle light, and leaving the ship in diving suits to collect oysters from the ocean floor. In his research, Delgado found a news clipping in a Panama newspaper, the Mercantile Chronicle, that described Kroehl's "revolutionary" submarine and how it worked. The story said that "before submersion enough air is filled into the compressed air chamber" using a pump from another boat until the chamber reaches a "density of more than 60 pounds." After the tank is sealed, "the men enter the machine through the tower on the upper side." Water is allowed to fill the ballast chambers causing the machine to sink to the bottom of the ocean. While there, compressed air is fed into the chamber to maintain a volume that resists the pressure of the water. This allows the men inside to "open the hatches in the floor of the machine" and recover oysters. 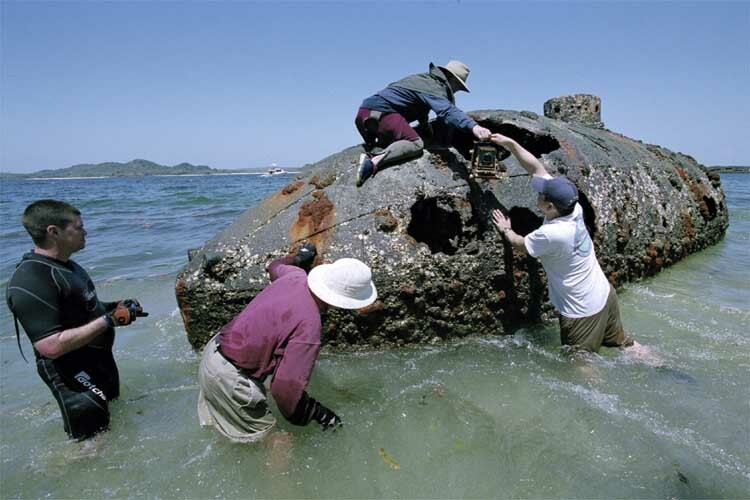 The story said that "when they have been underwater for a sufficient period of time and all shells within reach have been collected," compressed air is pumped into the ballast chamber. This forces out the water and the machine safely rises back to the surface. While it looked like a submarine, complete with coning tower and a hand-operate propulsion system, the device was used much like the old diving suits, with a floating ship operating an air pump system that kept divers supplied with air while they were submerged. The difference was that this was a giant bell that allowed up to six divers to use it at the same time. Kroehl's design, however, was one of several efforts being made by early inventors that all led to the modern submarine. Also built in that Civil War era was the H. L. Hunley, launched in 1863, and a nameless submarine used by the Confederates in 1862. Both have been raised and placed in museums. Kroehl served in the Union navy as an underwater explosives specialist during the Civil War, and he obviously became interested in designing an underwater machine for naval purposes at that time. But his transfer into the Louisiana swamps to serve as a scout subjected him to an illness, possibly malaria, that caused him to spend much of the war in bed, fighting long bouts of fever. By the time he had the plans for his machine on paper, the war was over the the military was not interested. Naval commanders of that era failed to recognize the importance this type of vessel was going to have in future warfare. Rather than give up, Kroehl in 1864 became chief engineer an a partner in the Pacific Pearl Company, which apparently helped him build his submarine. The New York Times reported its first successful dive in the city's harbor in the spring of 1866. Company investors were quick to have the machine shipped to Panama where it was to be used in a search for pearls and fortune. There was to be no fortune there for Kroehl, however. He died during sea trials the following year. Kroehl came to the United States in 1838 from Germany and settled in New York City. He became a U.S. citizen in 1840. City records show that he worked as an engineer in Lower Manhattan and obtained a patent for the "improvement of iron-bending machines." He also became interested in the diving bells used in city bridge construction. The other achievements by Kroehl during his time in New York included the construction of an iron fire watchtower in Harlem in 1865, and he was hired to remove a reef that was obstructing shipping in the East River.